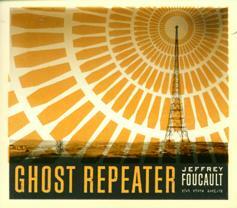 George Graham Reviews Jeffrey Foucault's "Ghost Repeater"
With communication, especially on the Internet being what it is, I suppose the concept of a regional sound in music is becoming obsolete, especially in something as ubiquitous as the folk-influenced singer-songwriter genre. Nevertheless, long-time fans and critics like me do tend to associate certain stylistic traits with certain regions. Often the artists themselves, when they are smitten by a style will journey to the supposed mecca for that kind of sound, be it Nashville, New Orleans or Austin, Texas. This week we have the latest recording by a gentleman whose music represents an interesting geographic mix, Jeffrey Foucault, whose new CD is called Ghost Repeater. Jeffrey Foucault grew up in Wisconsin, is currently based in Western Massachusetts, and draws considerable influence from the Texas singer-songwriter tradition, going back to Townes Van Zandt. And he went to Iowa to record his new CD. He comes up with a kind wide-open sound that evokes Texas troubadours and Midwestern expansiveness. Foucault started in music in his teens playing his father's acoustic guitar, and doing John Prine songs. A stolen copy of Live and Obscure by Townes Van Zandt led Foucault to immerse himself in Lone Star singer-songwriters like Van Zandt and Guy Clark, as well as the distinctive Midwesterner Greg Brown. By 19, he tried his hand at writing his own songs, and by the time he graduated from the University of Wisconsin with a degree in history, he was performing regularly in coffeehouses. He released his self-distributed debut album in 2001, and followed that up in 2004 with Stripping Cane, which did have national distribution. He has been touring extensively, and with Kris Delmhorst and Peter Mulvey also was part of a trio of Bay State singer-songwriters called Red Bird, which released a pleasing recording of acoustic covers of other people's music. With Foucault's admiration for Greg Brown, he hooked up with Bo Ramsey, Brown's long-time producer, who also produced Lucinda Williams. Foucault journeyed to Iowa to record with Ramsey, and according to the record company's publicist spent the coldest week of the year, in December, in Iowa City, with Ramsey, who played very tasteful guitar embellishments, along with bassist Rick Cicalo, drummer Steve Hayes and other guests to make the CD that sonically embodies Foucault's songwriting style and what I suppose could be considered the "environment" of the songs. The lyrics on Ghost Repeater are more allegorical and oblique than on his last album. There are songs that represent dream sequences, songs that hint at traveling, and one or two actual love songs, though they, too, are subject to interpretation. The often-sparse arrangements work very well with the lyrical style. Jeffrey Foucault's new CD Ghost Repeater represents a kind of closing of the circle for the Massachusetts-based singer-songwriter, bringing him back to the Midwest to record with Bo Ramsey, the producer with one of Foucault's acknowledged influences, Greg Brown. It's an excellent pairing. Ramsey's trademark sparse musical arrangements and his guitar work that is at once laconic, expressive and sometimes atmospheric, is a perfect fit for Foucault's expansive, often allegorical songs, and his vocal style that hints at the Texas school of singer-songwriters. While it's often a melancholy album, it is one that, like Foucault's past work, rewards you with some new discovery each time you hear it. Our grade for sound quality is close to an "A." Foucault's acoustic guitar has an almost three-dimensional quality, and the vocals and other instruments all have a commendable clarity and presence. But, as is so typical in these loudness-obsessed times, the dynamic range is impaired some by volume compression. Jeffrey Foucault's last CD two years ago was impressive. His new recording shows that it was not a fluke. He has all the qualities of great singer-songwriters, wherever they come from.